Credits go to: alyphoto, artwithannie, AshleySpatula, Azaiez, Clarazelli, crazycouture, ElizasJewelry, FizaDesigns, gardengypsy1, Gilliauna, PoppyPunch, PrimalOrganics, seamariecreations, Textilemonster, theshagbag, Upstyle and zxdrummerchic. I am so completely in love with these earrings! Those plum drops and the beautiful colors of the swirl beads. The whole combination just draws my eye and makes me salivate. Today's shop has a lot of gorgeous pieces like these, too! HeadpinWear on Etsy is filled with a terrific collection of beautiful jewelry from earrings to necklaces, bracelets and more. The shop is organized to find what you want, too! Not just with sections for each type of jewelry they offer but also an "under $20.00" section for those browsing on a budget. Czech glass shimmers among gemstones and crystals in this wonderful shop with a subtle, earthy feel combined with a touch of elegance. If you're looking for a piece of jewelry to complement your features, fashion and your unique style then this isn't a shop you'll want to miss! YOU CAN CLICK ON THE PICTURE ABOVE TO VISIT HEADPINWEAR'S SHOP ON ETSY AND TAKE A LOOK AROUND OR, IF YOU PREFER, YOU CAN CLICK RIGHT HERE. 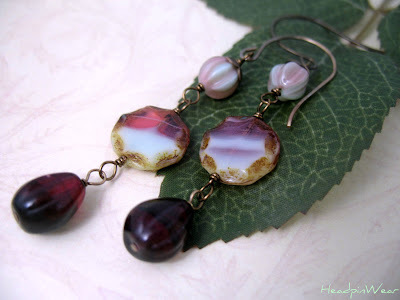 If you like what you see in Headpinwear's shop, you may also enjoy visiting the HeadPinWear blog or stopping by to say hi to the artist on Facebook! 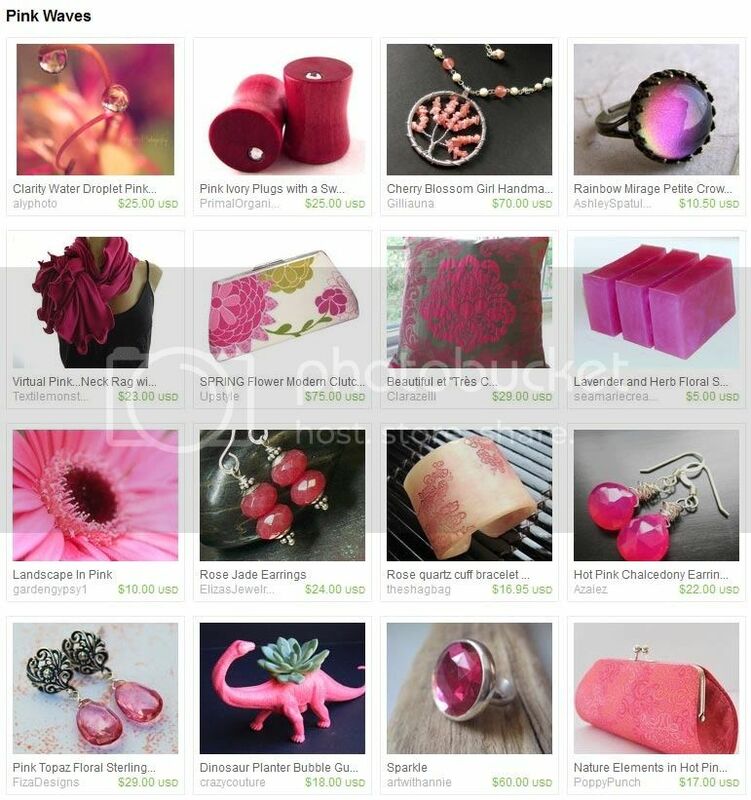 Filled with an eclectic mix of fabric jewelry, modern art to wear and unique accessories, today's feature is Tamdoll's Silver Mountain Originals on Etsy! This shop has a variety of pretty items from tote bags to jewelry and a handful of sewing patterns. 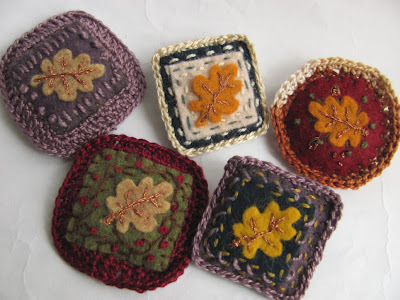 But I'm particularly drawn to the embroidered and felt brooches offered here and there's a series of them in autumn leaf colors that I adore. Fabric brooches and pins make a great gift for teachers of young children and child-care workers, especially, since they are soft and therefore less likely to hurt when bumped or scraped against. The versatility of these brooches is terrific and those offered in Tamdoll's shop are beautifully made and completely adorable. YOU CAN CLICK ON THE PICTURES ABOVE TO VISIT TAMDOLL ON ETSY AND TAKE A LOOK AROUND OR, IF YOU PREFER, YOU CAN CLICK RIGHT HERE! If you like what you see in Tamdoll's shop, you may also enjoy visiting Tamdoll's blog or stopping by to say hi on Twitter! Copper and steel, silver and bronze. Today's Mosaic is all about artisans that work with metal. Whether forging or wrapping, molding or pounding, these artisans create amazing designs with their own unique flair and personal style. A self-taught full-time wildlife artisan since 1974 inspired by the beauty of nature and with a special affinity for crows and ravens in particular. In this shop you will find a variety of creative pieces from caste raven skulls to remarkably detailed metalwork pendants, rings and more with themes based in nature such as claws and skulls, hearts and anatomy pieces, animals, reptiles, etc. Having years of experience with metal-working from mechanics to freelance iron contracting, this artisan creates a variety of unique handcrafted ironwork pieces from wall art to signage for homes, farms and more. A husband and wife team, they work together to offer one of a kind custom designs including special orders. Remarkable wire-work jewelry! This artisan shows an amazing talent with wire that's demonstrated in every piece of jewelry offered in her shop. These handmade artisan jewelry pieces are designed using sterling silver, copper and gemstones in styles that range from everyday-wear to gorgeous artwork to wear. Custom handcrafted copper work sculptures, fountains, birdhouses, planters, home decor and art designed and backed by 35 years of experience. These pieces are perfect for indoor or outdoor use and the artist offers a wide variety in his shop. The birdhouses in this shop are particularly breathtaking in my opinion. I hope you enjoyed this tour through a few of the amazing artisans and artists on Etsy whose metalwork and creative spirit has caught my eye and hopefully yours too!